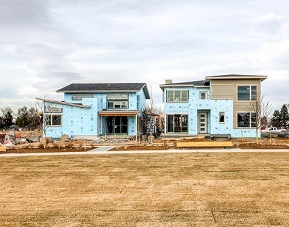 Following the highly successful introduction of the Avenues Collection in central Denver’s coveted Lowry community, homegrown Denver homebuilding partnership, Berkeley Homes and Harvard Communities is well under way with the construction of two Park Collection models in the same Boulevard One at Lowry enclave. Renowned for award-winning innovations in new urban, energy-efficient designs, Berkeley/Harvard’s Park Collection offers something nearly impossible to find in the city of Denver: twelve unique, park-front home sites. The Park Collection offers both ranch and two-story homes featuring classic-contemporary designs, elegant outdoor living spaces, innovative entertainment areas and generous master suites. Add to that Berkeley/Harvard’s long-standing commitment to building to the highest energy efficiency and green building standards and it’s clear to see why buyer interest is high. Once an annex near one of the former Lowry Air Force Base’s administration buildings, Boulevard One is tucked between Crestmoor Park and Lowry’s energetic Town Center, just south of E. First Avenue and Magnolia. Park Collection homes are thoughtfully situated along Lowry’s Northern Linear Park, a meandering pedestrian parkway with several inviting lifestyle-enhancing benefits. Berkeley/Harvard’s Park and Avenues collections place energy-efficient design high on the list of homeowner benefits. Avenues and Park Collection homes feature tankless water heating, staged-and-zoned HVAC systems, new-tech windows and insulation that is expected to deliver HERS scores below 40, which is 150 percent better than a code-built new home. For more information about Berkeley/Harvard home collections in Boulevard One at Lowry, visit: www.liveberkeley.com/where-we-build.